We make a range of luxury yurts for sale in the UK and Europe, and beyond. We are well-known yurt makers both in the UK and Europe, with a reputation for quality, care and attention to detail. We combine quality materials, the craftsmen's technique and the artisan's aesthetics to craft a yurt that brings history to bear on the present, breathing life and vitality into these simple yet beautiful structures. Our yurts are designed to work in all climatic conditions. If you have any questions regarding your specific climate please contact us. 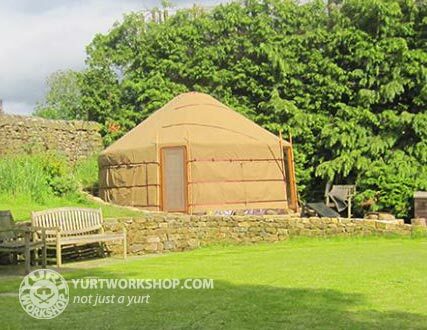 As experienced yurt makers and craftsmen who have been building and selling yurts for many years, we pride ourselves on good business practices, responsive customer service and clear communications with our customers. After discussions with Rob, decide on the size & specification. We provide an estimate and we agree to a payment & completion schedule. Contact prior to build to confirm details. Dispatch to any location worldwide /pick up. We love the challenge of bespoke and custom design work. Whatever your needs please contact us to see if how can help. Pricing: Our yurts start at £2000. We offer a lot of variety and a lot of different specifications and accessories. We get to work with the very best customers. Ratna and I are continually commenting on our good fortune. Over the years of yurt making we have met so many wonderful people and often they are involved with interesting projects and offerings..